For years, the internet has hemmed and hawed over a mysterious yet universal truth: a grape, sliced nearly in half and placed in the microwave, will suddenly begin to spit plasma. The fiery sight had us mystified for years, garnering millions of views online and a variety of expert opinions, none of which were based on formal research. Now, at long last, a team of three physicists thinks they have it figured out. The newly published paper is the first peer-reviewed study on the topic, and the findings suggest that the most popular explanation put forward by armchair experts is probably incorrect. Over the years, several sources online have proposed that grapes create plasma because energy in the microwave charges up electrolytes in their water-heavy interiors. This, in turn, is thought to cause a flow of energy between the two slices of grape, a force that travels across the skin like an electrical wire. When enough energy is gathered, the whole thing produces a spark of plasma - an ionised gas that emits light - at the bridge of skin connecting the two. FORT LAUDERDALE/DAVIE, Fla. – The great white shark is one of the most recognized marine creatures on Earth, generating widespread public fascination and media attention, including spawning one of the most successful movies in Hollywood history. This shark possesses notable characteristics, including its massive size (up to 20 feet and 7,000 pounds) and diving to nearly 4,000 foot depths. Great whites are also a big conservation concern given their relatively low numbers in the world’s oceans. In a major scientific step to understand the biology of this iconic apex predator and sharks in general, the entire genome of the white shark has now been decoded in detail. A team led by scientists from Nova Southeastern University’s (NSU) Save Our Seas Foundation Shark Research Center and Guy Harvey Research Institute (GHRI), Cornell University College of Veterinary Medicine, and Monterey Bay Aquarium, completed the white shark genome and compared it to genomes from a variety of other vertebrates, including the giant whale shark and humans. The findings are reported in the ‘Latest Articles’ section of the journal Proceedings of the National Academy of Sciences, USA. World Japan: Thieves stole a rare 400-year-old bonsai from a Japanese garden. Fuyumi Iimura has a message for whoever broke into her family’s expansive garden outside Tokyo and made off with a small fortune’s worth of some of the planet’s most beautiful bonsai trees: please water them. A series of Mozilla bug updates, though, tells us that these features will soon be landing as part of Firefox's Content Blocking feature in the near future. 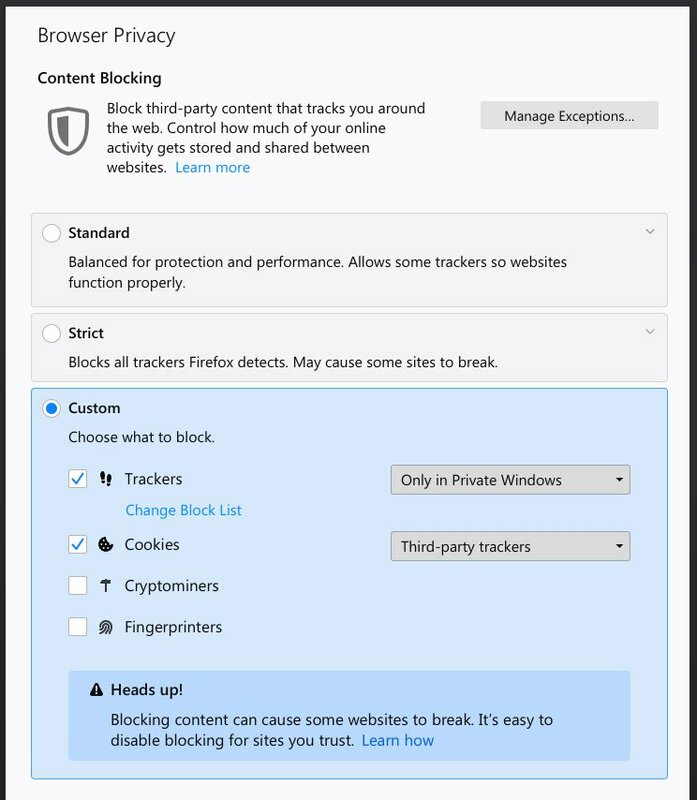 In one of the bug posts, Mozilla has uploaded a mockup of how cryptomining and fingerprinting detection and blocking will be added to Firefox's Content Blocking privacy feature.